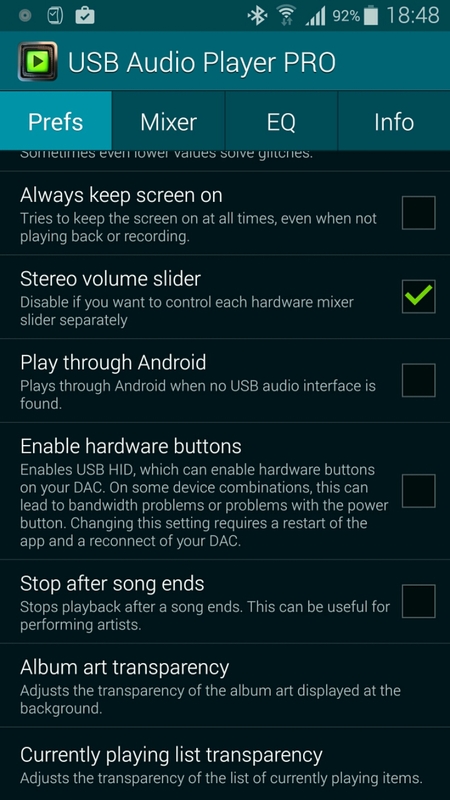 USB Audio Player PRO app on android – what a difference ! 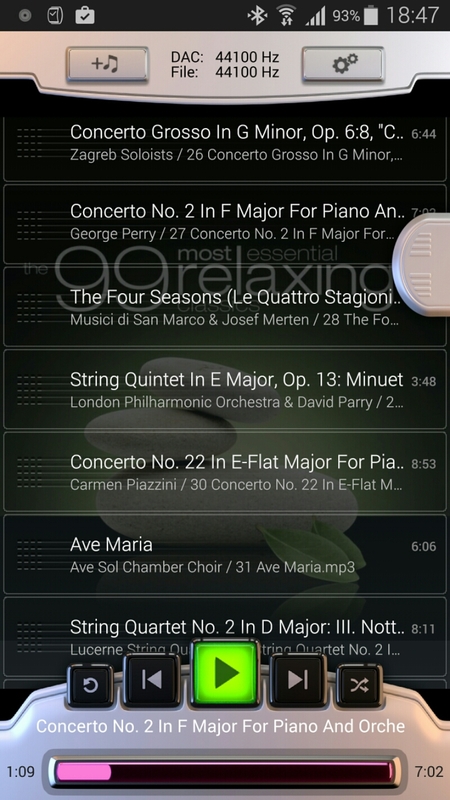 USB Audio Player PRO (Google Play link) is one awesome app if you are into using your android phone as a high quality audio music transport system. The above may sound rather technical but all it does is provide astonishingly good playback in to a connected USB DAC. Let me explain further. I use my Note 4 in this setup. I’ve copied my music from iTunes on to a large micro sd card. The music has to be stored on the device and there is no compatibility with Google Play music. If you wanted to use music stored on your network this is possible via Samba shares, windows or a NAS. Connected to my Note 4 is a HiFiMeDIY Sabre Android USB Dac which then connects to a Cayin C5 Portable HiFi headphone amplifier. But the key part of this chain is the USB DAC. So prior to using USB Audio Player PRO app for android, I was simply using either Google Play music, deezer or the Samsung Music app to feed the USB DAC. As I discovered it wasn’t a totally smooth affair. So I installed the trial version of this app which is time limited but still offers plenty of time to evaluate and test the app will work with your phone. 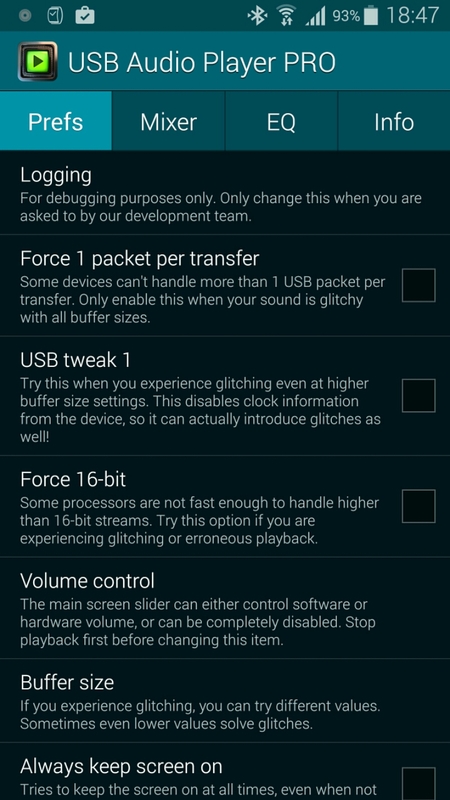 The app contains it’s own custom driver that only works when the app is running, hence why you cannot use other apps to playback the music. The player controls are rather basic as shown in the first screen shot above. There are a number of settings as shown below. Selecting music is fairly straightforward but note that there are no fancy options or the ability to create new playlists. So what’s the end result? It’s night and day better. Beyond anything I ever thought possible and a total revelation. I wish I had used this app before. Using this app you will listen to a track and hear stuff you never heard before. The punch, accuracy, detail and every aspect of the music is transformed. It is so good I can plug any of my headphones directly into the HiFiMeDIY Sabre Android USB Dac without using the headphone amplifier, although with the headphone amp it becomes even better. And one last point. I’m not using FLAC music files, just good old mp3 at a recording bit rate of 320 bits. Sounds interesting, if you’ll excuse the pun. Is the music you copied over from iTunes in the standard Apple encoding or is it MP3? If it is the latter, is there a minimum bit rate you need to encode at to benefit from Dac? 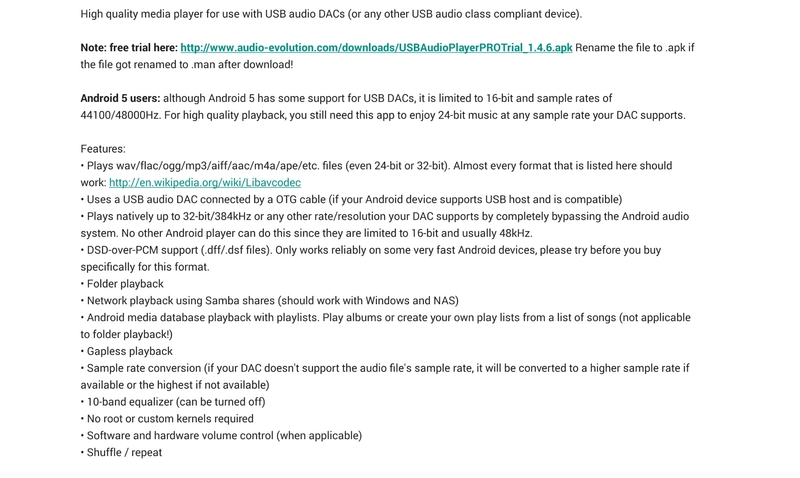 Mostly mp3 but some purchased music is at 256aac which is Apples standard offered bit rate. You would benefit from any bit rate but for Apple encoded 256 aac would be the lowest I would go. At 320mp3 bit rate again this is my preferred lowest. Obviously if you used other higher quality options you would benefit more. Thanks. I’m new to this whole Dac thing. I have been pondering getting a decent set of Bluetooth headphones. Have you done any comparison between sound quality over Bluetooth versus over USB Dac? No comparison. I have a good pair of Bluetooth cans. Convenience vs quality. However most people may not care. I doubt there is any “extra” quality than can be dug up out of a 256 or even 320 kbps compressed file by an app, “pro” or otherwise. And the DAC cannot really give you quality that was never there in the first place from the source data. My guess is any gains here are literal i.e. output increase from the headphone amp. The decoding driver undertaken by the app improves the situation. The better the software and dac the better the end result. Absolutely yes in theory. But in practice your source data is already butchered. Music file compression made sense in 2001 when we were happy as hell to own a 32 MB mp3 player and thought THAT was futuristic. But by now you can go out and buy a 128 GB micro SDHC card that is smaller than your finger nail. Storage is a well solved problem. Ergo music file compression is a redundant solution. So I dont even know why we are dealing with compressed files in this day and age…… other than the music companies using it as a form of DRM so you dont have a perfect copy of the music you supposedly bought. Which brings me back to my point. I cant see the point of investing huge amounts of money to improve the signal path AFTER an already butchered (compressed) music source file. First begin with clean data ie FLAC. Tried this using some FLAC files I have on my SD Card – wow is all I can say. The Sabre DAC sounded great on these files before, but I had some glitches 2 or 3 times per song which were off putting. 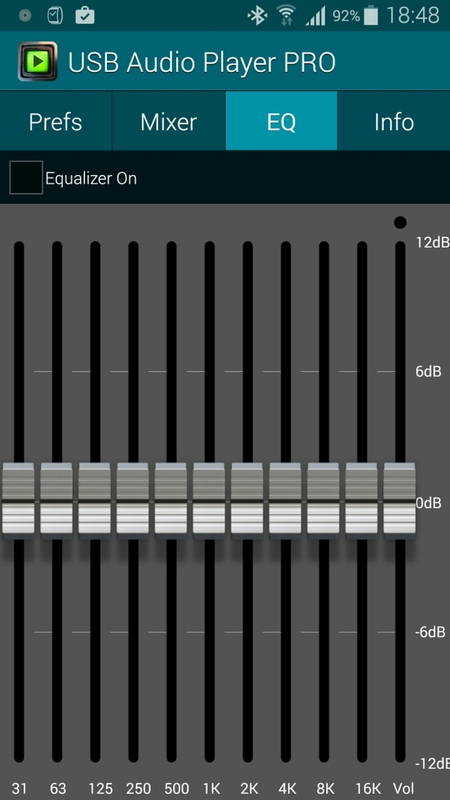 Using the trial of this app, and the glitches have all but gone in my testing so far and sound quality to my ears genuinely has ‘matured’ to an even better level. Exactly same experiences with myself. Just alter the buffer size. That will remove the glitches. Best money I ever spent on an app !!! One should also note that this program is likely collecting your personal information. One can understand the first permission. But the second one? Uh no – not necessary at all. The developer is well known in the audio circles. Nobody has complained. The second one is okay as it’s when calls interrupt music. I get the fact you don’t agree with everyone who has tested and used this app and has heard the real wow changes. I dont agree that the Device ID & call information is a necessary permission. I haev used podcast apps that did not require it and still behaved properly when a call came in. Besides which one should understand the risks involved in such a deep permission. Especially when it is not necessary at all for the type of functions. I mean even my mother, father and my girlfriend dont have open access to a stream of my call logs. Why should a music player have it? Many programs are far too liberal with demanding these types of permissions. They shouldnt. I will also note thathave not been “aggressive” towards the developer – rather I have been factual. This is a huge risk. I’ve emailed the developer. Will update post after a reply. But I checked the app permissions and the second one is to read phone status. That makes sense. Device ID is likely tied into the license check. But I’ve asked developer to respond. So let’s see. Personally I know of many people using this app so am relaxed. But I will get a formal answer to ascertain situation. I dont think its so simple as “many people use the app”. I know of many popular apps that demand ridiculous permissions. Even major companies like Skype or Linked in, never mind the smaller developers. They are all taking liberties and grabbing information – or at the very least opening a huge door to do it at will. – dot not require access to your phone number and your entire call logs in order to have seamless call handling. That’s not speculation, there are apps that do those things without those permissions. So I hope the question put to the develop includes something like “there are apps that dont need such permissions in order to perform this function, so why does yours demand it”? So the Device ID is not necessary for getting paid, that’s for sure. I’m going to guess that the pause on call can be done by using changes to audio focus instead of reading phone state. I have had a response from the developer with an explanation. I will create a new post for tomorrow as it is worth doing so, but in summary there is nothing to fear whatsoever. Hope you get a good answer on the call ID issue – I note well known apps like All Cast use those permissions also so wonder if its due to a particular way some devs handle certain events? Anyway – sonically, this has blown me away and shown what my Sabre DAC can really do – instruments suddenly have a more realistic tone to them, soundstage is far more open – its like my ears have suddenly become wider apart :p Plus, during my 30 minute walk to work, I didn;t have a single glitch. Ok. I’m going to give this a try. Just ordered a HiFiMeDIY Sabre Android USB Dac (using your Amazon link 😄). My ears are pretty bad these days, with a combination of Ménière’s disease and tinnitus, but maybe that’s more of a reason to get better quality sound. At £26 it’s not too much of a risk. Thanks Graham. I hope it shows up with Amazon. See hit or miss sometimes. USB Dac arrived today. I can hear a noticeable improvement in the sound quality of all the mp3s I’ve tried so far. With some the improvement is startling. Very pleased with the results, so thanks for this article. That’s good news ☺ I’ve been listening with mine for hours today and also amazed still.